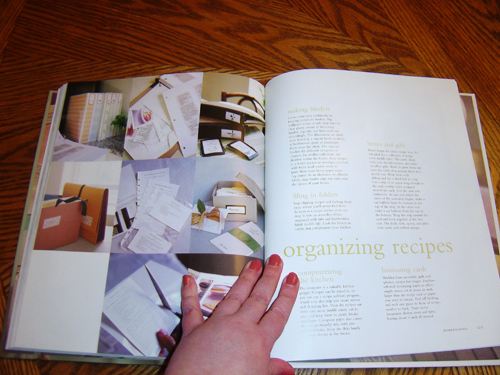 s I mentioned in my Good Things book post this week, I desperately need to go through and organize my recipes. I have a terrible habit of bookmarking a ton of recipes to try and never getting to them, that doesn't even include all the recipes I've collected from books, magazines, friends, and family. Just based on the number of recipes I've bookmarked or saved from the internet alone I could make a new recipe everyday for the next 5 years and still have more to tackle. New Recipes or Old Favorites? They say variety is the spice of life, but really, if you are like me, you have favorite recipes... your family has favorite recipes... and you tend to make those same recipes. We sprinkle in some variety here and there, but our favorites tend to keep making their appearance. So, I know I'm not going to try a new recipe every day for the next 5 years. It's time to purge. 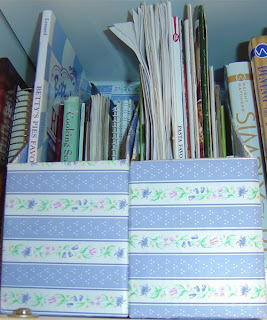 My current system for clippings and tiny recipe booklets is a magazine file box covered in contact paper. It doesn't work! I can never find anything... they are all contained, but I don't use it because there is no filing system or index to it at all. There are only a few sheets I reference in it and they are at the very front. I've been holding on to most of them because they came from my great-aunt when she passed. I need to be honest with myself though about whether I really need to keep all of it. She was famous for her fudge, it's a recipe I will treasure forever, but a lot of them are clippings from articles of recipes I don't ever remember trying. I'm guessing she had the same unhealthy addiction to recipe clipping as I do. Instead I'll go through them and offer them up to anyone who wants them and then part with the bits of paper. Now, what to do with what I keep? I do have a few food magazines, but how often do I really reference them. Not very. I'll make a few recipes the first month, and then it just sits. Plus most of the magazines have their recipes online, so I'll be checking the website before I decide to keep the magazine. If that particular recipe is not online, I need to scan or clip it rather than keep the entire magazine. It seems like more than 50% of a magazine is ads, so I'm wasting a lot of space storing ads for 1-5 recipes per magazine. I like the idea of typing in recipes and having the clutter free digital copy, but you run the risk of transcribing errors: Missing an ingredient, incorrect amounts, tsp instead of tbsp would be a very easy mistake. So, how about scanning in the recipes? I do like the idea of Scanalog, but I don't see anywhere that indicates you can search on text. I think you are stuck searching based on whatever keywords you assign when you scan the item. Please correct me if you use the software and I am incorrect in stating this. Scanalog has no free trial to download so I can't make any recommendation either way. I'd actually rather use something like Evernote or OneNote that will not only find any keywords or notes typed in the software itself, but also in scanned images (Scanalog doesn't seem to have this feature either). 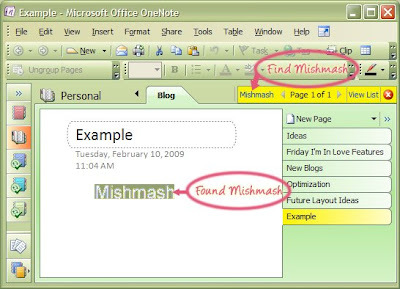 As a quick example I typed Mishmash in photoshop, saved it as a .jpg file and pasted it into OneNote, then searched for Mishmash (yes it's an odd word, but I had to think of a made up word with no possibility of already existing). Note: Remember Mishmash is not text, but an image. 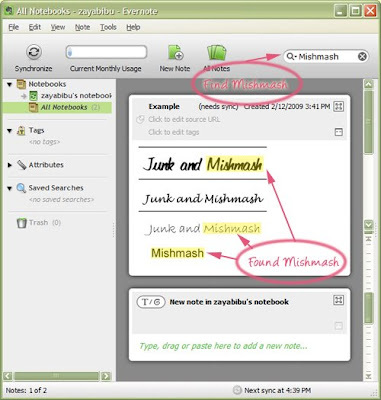 Now that is convenient, but Evernote has a much better text recognition engine. My opinion, but the proof is in the pudding, so to speak. See those extra handwritten looking fonts? The only one that Evernote didn't recognize clearly was the 2nd. It recognized that as JunkandMishmash, with no spaces, so it wasn't found. The other two it recognized just fine. They aren't in the OneNote example, because OneNote didn't recognize them at all so I left them out. OneNote is $100, EverNote is free/$45 per year depending on how you use it. Want to use this for recipes and never sync to the web or another computer, you can turn off syncing and it's free? I know it will be a bit of a project, but I'm leaning towards scanning my recipes. Letting go: I'm going to toss and pass on any recipes that I know I will never make. Scan recipes and let software catalog them: I'm going to try both EverNote and OneNote and see which wins. I already use OneNote for other stuff, so it might make more sense to keep everything together. However, if EverNote does the better job with scanned text images, I will use EverNote. Honor an expiration date: EverNote and OneNote both date items. I'll keep untried recipes in one notebook and tried ones in another, if it hasn't been tried within a year and I didn't clip it for a particular occassion coming soon, it should go. Keep the favorites: There is no need to keep 15 chocolate chip cookie recipes, pick a favorite cakey, crispy, and chewy recipe. As I find a new favorite, I'll replace the existing favorite, don't keep both. Keep a recipe index: I plan on keeping a running list of the recipes that I try and what my thoughts were on them. I'll also keep a tally of how often I make it, once I've made it 5 or more times I'll transcribe it onto a recipe card for a permanent home in my kitchen. My computer is in the next room and I don't care to bring it in the kitchen where it could get spilled on or worse. This needs to be cleaned out, so I can fit my favorites and not just every random recipe scrap. I thought I'd provide a little free download for anyone who wants to use it. 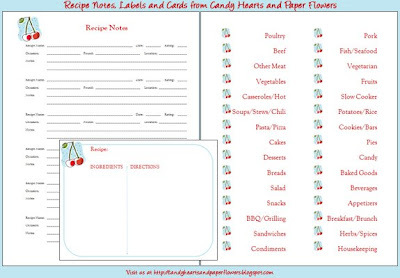 You can buy blank recipe cards from Avery and print your own, here are some recipe cards, recipe labels and a recipe notes worksheet for your home manual. I hope you like them. They are in Word 2007 format, if you'd like another format, let me know in the comments and I'll do my best to accomodate you. You can view Word 2007 in earlier versions of Word with this converter. Want to create your own home manual? Thanks, I will go check out the sites. Remember this http://www.3sidesofcrazy.com/2008/09/homemaking-september-shape-up-menu.html? 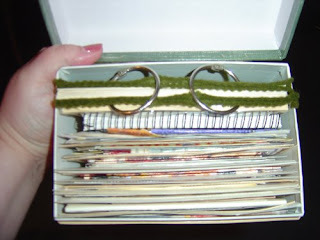 I still use that silly record box with file folders by category. I sit down every few months and read through them of an evening to see if they are still appealing. As far as the magazines I read them each month, cut out the appealing ones and add them to the file. Then I recycle the magazine - I hate magazine clutter. Hey Barbara!! Want a perfect peanut butter/choco chip recipe? Or sour cream banana bread?? Tried and true - and truly the bestest! See you soon!! P. S. I found you!!! I am interested in scanning my recipes also. Which worked best- evernote or one note? Evernote worked better, the recognition software works much better. However, I am using OneNote with tags, mainly because I was already using it for recipes and it was less work to tag what was there than to move everything I already had in there. If I was starting from scratch, I'd have gone with EverNote.